Today we continue our brief aside in examining and celebrating the life of Fr John Sullivan SJ. 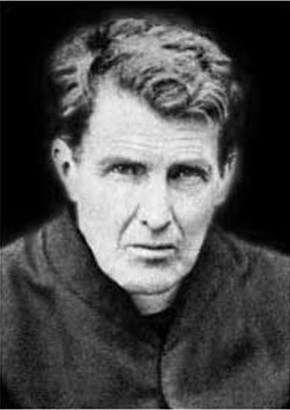 He was ordained with Fr Doyle on 28 July 1907, and it is only right that we celebrate his beatification with great joy, for it truly is good and important news for the entire Church in Ireland. Yesterday we gave a very brief overview of his life. Today we will look briefly at his spirit of penance; tomorrow we will look at his care for the poor and sick and on Thursday and Friday some of his prayers and sayings. We are all, to a greater or lesser extent, creatures of our time and culture. No matter how revolutionary or different we may consider ourselves to be, we are all to some extent or another reflections of the culture (whether secular or ecclesiastic) in which we live. This was as true of Fr Sullivan and Fr Doyle as it is of you and I. As such, both Jesuits were influenced by the penitential practices that were the norm during their lives. Fr Sullivan, just like Fr Doyle, was a man of penance. This was not the dominant note of their lives and they should not be defined by it, but by the same token, ignoring it gives an incomplete picture of their spirituality. In their attitude towards penance they reflected the culture of their times. More particularly they were both deeply influenced by their novice master, Fr Michael Browne SJ, who proposed an especially militant and ascetical standard for his novices to live by. It is noteworthy that the two principal biographers of Fr Doyle and Fr Sullivan (Alfred O’Rahilly and Fr Fergal McGrath SJ, respectively) make special reference to Fr Browne’s influence, and the concern some other Jesuits had about the impact of his example on impressionable young Jesuits. And there is perhaps a lesson there for us – the penances of those who had advanced far in their union of God may be admired at a distance, but they are rarely to be imitated by the rest of us. Relatively little is known about Fr Sullivan’s life of penance compared to Fr Doyle. The latter, of course, keep detailed private notes as a personal spiritual aid, and these were published contrary to his wishes after his death. Fr Sullivan seems to have either kept no such personal notes or to have destroyed them. If he destroyed them he would not have been the only one – Fr Michael Browne, the novice master, is known to have destroyed his personal diaries as death approached lest his notes be published as Fr Doyle’s were. Perhaps the first and most obvious sign of Fr Sullivan’s penitential habits was evident in his dress, even before he became a Jesuit. As noted yesterday, there were some who considered the young John Sullivan to be the best dressed man in Dublin. But upon his conversion he began to dress more simply, limiting himself to plainer clothing. This was both an act of humility and also, undoubtedly, an act of penance for a man of his background. This practice stayed with him for the rest of his life. In fact, his clerical clothing and cassock were continually patched and repatched, and became so old that they were almost green rather than black. He was never known to use an umbrella or gloves (and his hands would become cracked with chilblains), and he used a waterproof coat rather than a proper woollen coat in winter. He often spent great parts of the night in prayer, depriving himself of sleep in the process. Workmen spotted him one bitter night praying for a prolonged period at the graves of the deceased Jesuits buried in the community cemetery. In fact, he seems to have slept little – many nuns reported that he never slept in his bed when he visited convents to direct retreats, and the servants who looked after his room once tested this theory by placing feathers in the bed to see if they were disturbed. They weren’t. He either spent the nights in prayer or slept on the floor. Perhaps most significantly of all, Fr Sullivan was known to eat little for most of his life as a Jesuit, having some servings of rice and bread each day. It was only under doctor’s orders that he began to eat more food later in his life. Fr Sullivan’s hard life did not repel the ordinary people of his day. As one of them perceptively reported when she sought him out for his prayers: “He is quite an exception. He is very hard on himself. You have to be hard on yourself to work miracles. And he does it”. Tomorrow we will consider some of those alleged miracles.